Floyd Mayweather ended highly successful 2015 calendar year as the highest paid athlete in the world with total earnings of around $300 million from his two fights. He made around $260 million from Manny Pacquiao fight alone which was the biggest purse in history of boxing while he made another $40 million with his career’s last bout against Andre Berto. 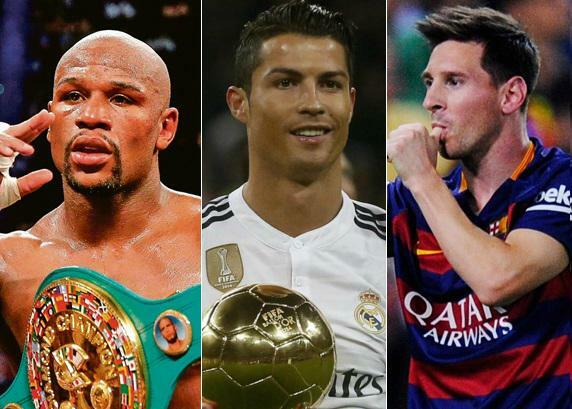 Mayweather has topped the highest paid athlete list for last 4-5 years and but since he is retired we are likely to see the likes of Ronaldo and Messi making it to the top. We take a look top 25 athletes according to their earnings in 2015. Total earnings include both their professional sports contracts/winning and the endorsement deals. 3 Cristiano Ronaldo $79.6m Highest paid footballer with lucrative $408,000 a week after tax contract with Real Madrid plus multiple high profile endorsement deals earning him around $27 million a year. 4 Lionel Messi $72.3m Messi also have after tax contract with Barcelona earning home around $400,000 a week plus number of lucrative endorsement deals like Adidas, EA Sports, Turkish Airlines to name a few. 5 Roger Federer $67m Earned around $9 million from his winnings in major tennis events in 2015 plus his lucrative deals with Nike, Rolex and Credit Suisse etc earning him massive $58 million in sponsorship money. 6 LeBron James $64.8m $20.8 million in salary plus his biggest endorsement deal history with Nike earning him around $40 to $50 million range. 7 Kevin Durant $54.1m $19.1 million in salary plus 10 year endorsement deal with Nike worth $285 million earning him around $28.5m a year. 8 Phil Mickelson $50.8m Only $2.8 million in golf winnings but oldest man in the list still making a massive $48m in sponsorship money with incredible contracts with blue-chip companies like Callaway, Barclays, KPMG etc. 9 Tiger Woods $50.6m Only made around $600,000 from his actual winning in golf last year but living off well with lucrative deals and being the face of Nike, EA Sports Golf. Nike still pay him around $20 million being part of nike golf. 10 Kobe Bryant $49.5m $23.5m salary with LA Lakers and a $26m worth of endorsement deals with Turkish Airlines, Nike, Lenovo, Hublot and Panini plus his own Kobe Inc in full flow. 12 Rory McIlroy $48.3m Earned impressive $16.3m in 2015 in his golf winnings and combine that with his lucrative sponsorship deals where he takes home as much as $32 million. 14 Zlatan Ibrahimović $39.1m $355,000 a week salary with PSG takes his yearly earnings to $31 million plus a another $5 to $6 million in endorsements. 15 Lewis Hamilton $39m Signed financially improved deal with Mercedes after winning 2015 title where he will earn $36m a year guaranteed for next three years. Another $3m a year in sponsorship deals with IWC and Bombardier. 16 Ndamukong Suh $38.6m Signed a massive 6 year deal with Dolphins worth $114.3m in total. His base yearly salary is around $35m. He also got $25m in signing bonus. 18 Gareth Bale $35m $25.5 million a year with his Real madrid contract plus sponsorship deals with adidas and other companies. 19 Jon Lester $34.1m Signed historic 6 year deal with Chicago Cubs a deal worth $155 million over six years. 20 Derrick Rose $33.9m Signed a 5 year deal back in 2012 with Chicago Bulls worth around $94.3m. With base salary of $18,8m a year. 21 Sebastian Vettel $33m Signed the biggest deal in Formula 1 history back in 2013 where he earned $50m in first year and guaranteed $30m plus bonuses in remainder of the 3 year contract. 22 Rafael Nadal $32.5m Only around $2m in tennis winnings during 2015 but his sponsorship deals with companies like Nike, Tag heuer etc earns hom cool $25m to $30m a year. 23 MS Dhoni $31m Only $4.5m in salary with national indian team and domestic IPL contract. Majority of his income comes from massive list of endorsement deals in India. 24 Neymar $31m Already a household name and one of the most marketable athlete in the world. Neymar earns around $14m with his Barcelona contract plus another $16m to $18m in sponsors.